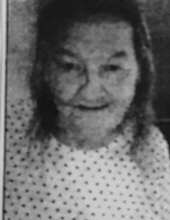 Helen Louise Davis age 83, New Castle resident passed away on Friday March 29, 2019 at Ball Memorial Hospital after an extend illness. She was born February 28, 1936 in New Castle, Indiana a daughter of the late Calvin Davis and Helen Mahan Davis Dickerson. New Castle was home all her life. She was a devoted daughter, wife and mother who enjoyed spending time with her family and friends and spending time outdoors especially fishing and feeding the ducks at memorial park. She loved all kinds and animals and racing at Mt. Lawn Speedway. Left to cherish her loving memory include her two daughters; Corliss Poynter and Ada Robertson; two grandsons Rodney Poynter and Mitch Robertson; five great grandchildren, three sisters Bonnie Overton, Patty Custer and Joyce Davis, one brother Calvin “Bud” Davis and several nieces, nephews and many friends. Family and friends may call from 11:30 am until 1:30 pm on Thursday April 4, 2019 at Macer Hall Funeral Home and Cremation Service. Macer Hall funeral directors are honored to serve the family of Helen Davis. To send flowers or a remembrance gift to the family of Helen Louise Davis, please visit our Tribute Store. "Email Address" would like to share the life celebration of Helen Louise Davis. Click on the "link" to go to share a favorite memory or leave a condolence message for the family.